Littles can let their imaginations run wild as they learn new skills. Crayola released a new mobile app for kids aged three to five, which was designed to help littles learn skills and concepts such as logic, coding, color theory, and more. The app is called Crayola Create and Play. Create and Play has five main areas for kids to play around in and explore. Kids can create and take care of colorful creatures in the Pet Park, experiment with colors in the Color Lab, create beautiful masterpieces in the Art Station, and learn new skills in the Colorful Classroom. Finally, kids can play simple games and activities (like jigsaw puzzles) in an Arcade. Each area has multiple activities to complete. For instance, in the Art Station, kids can create drawings from scratch on blank pieces of paper, color on a number of different coloring pages, or even take a picture that’s transformed into a coloring page within the app. Meanwhile, in the Colorful Classroom, they can learn the basic principles of coding by leading a paintball to a target across stages that become more difficult over time. This area also lets kids practice their knowledge of letters and shapes. To keep kiddos interested, the app will be updated with new content, activities, and games for them to try each month. 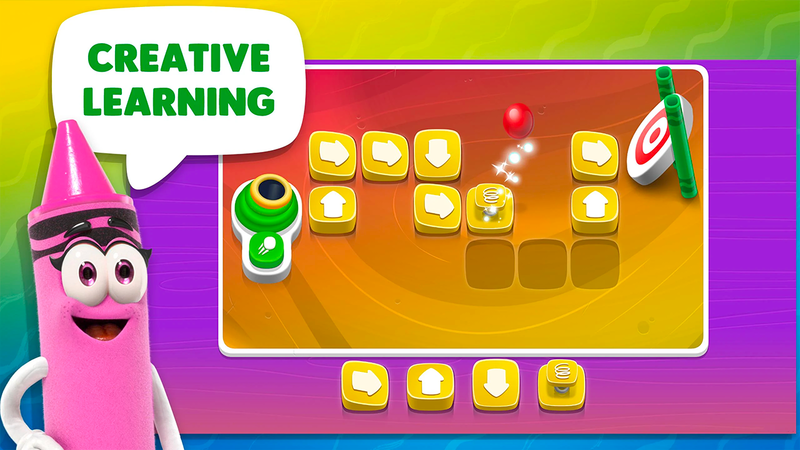 Crayola Create and Play is available to download for free on iOS and Android devices. Kids can try the app’s activities during a limited time free trial; after that, parents will need to commit to a monthly subscription price of $5.99 per month (or $39.99 per year, if it’s purchased in advance). Until December 14, users can subscribe at a discounted price of $3.99 per month.